■ What is Swiff Chart? Swiff Chart lets you create Eye-Catching Animated Charts in Macromedia Flash?format. Paste your data from a speadsheet or import a formatted text file, choose a predefined Chart Style, adjust parameters and instantly export your animated Chart as a Macromedia Flash?movie. Specifically designed to address the very needs of professional users, Swiff Chart Professional Edition includes a complete built-in annotation system to produce/enhance/highlight advanced charts. In order to maximize productivity, data series can be imported from a Microsoft Excel WorkSheet. The produced chart can then be directly exported into a Microsoft PowerPoint Slide or Presentation. This edition also includes additional professional export features like Adobe PDF (Portable Document Format), SVG (Scalable Vector Graphics) and SVGZ (Compressed Scalable Vector Graphics). The Standard edition offers all the capabilities of the powerful Swiff Chart engine to create your charts in Macromedia Flash. · Support of single data series and multiple data series. · Copy the data from your spreadsheet and paste them directly into Swiff Chart. · Import your data from a simple text file and choose the desired data delimitors (tab, space, comma, etc...). · Use the Swiff Chart simple integrated spreadsheet for quick data values modifications. · Use Drop Shadow, Outer Glow and Stroke to highlight your charts. · Individually apply complex Gradient fill to almost all the various chart elements (axis, gridlines, column, etc...). · Individually apply and synchronize complex animations to all the chart elements. · Save your creation as a Chart Style and include it in your own style library for future use. 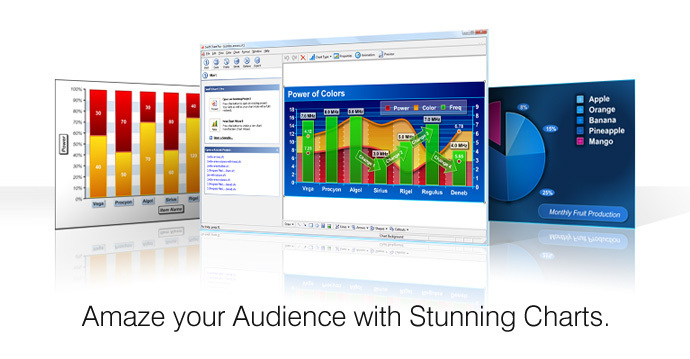 Use Swiff Point Player to incorporate your Flash Charts into your PowerPoint presentations. Swiff Point Player is the premier Microsoft Powerpoint Add In for inserting and playing Flash movies in Microsoft Powerpoint presentations. Read more about Swiff Point Player. Swiff Chart has been designed to maximize your productivity while preserving creative freedom. You no more need to spend hours to manually animate a complex chart that contains high amount of data. · Paste your data from a spreadsheet or import them from a formatted text file. · Apply a predefined Chart Style and save your own one. · Adjust the parameters with instant visual feedback. · Use the Toolbar buttons to quickly access and tune the chart layout. Studies show that more than 97% of Web Users can experience Macromedia Flash?animations without having to download and install the free player. Therefore your Chart can be safely published on the Internet and viewed by Windows?Users, MacOS?Users, or Linux?Users. How to insert a Flash Chart into a Web page.